Jeanette Winterson is a fiercely intelligent writer and this is her response to climate change, much as The Word for World is Forest was Ursula Le Guin’s response to the Vietnam war. 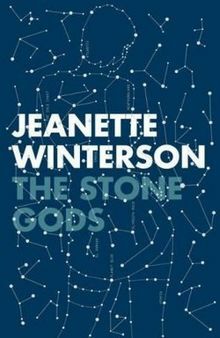 The cover may be restrained but The Stone Gods is as zany, in part, as anything Douglas Adams ever wrote. It is also sweetly romantic, raunchy and searingly polemical – The Hitch-hikers Guide to the Galaxy meets Rubyfruit Jungle and Collapse. Superficially it is a love story replayed against our remote past and our near future but lurking just beneath the surface is a savage attack on the myopic corporatism which insists on business as usual while the global environment goes into toxic shock. It’s a wild ride. The protagonist, Billie Crusoe, is female in two of her incarnations and a sailor marooned on Easter Island in the third, and her beloved is sometimes a robot. In one incident in the post-apocalyptic near future, bikie vigilantes rescue Billie from corporate thugs disguised as Japanese tourists. The confrontation escalates, and a few hours later members of the lesbian vegan rock band are handing out assault rifles. Review by Malcolm Tattersall, 2007, revised and extended for Green Path 2016.